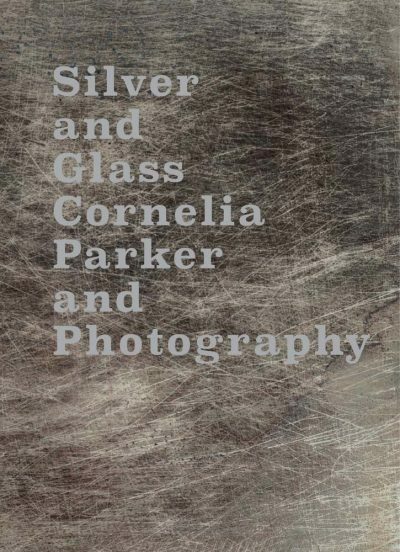 Silver and Glass is the first publication to explore the application and influence of photography in the art of British artist Cornelia Parker (b.1956). The book is illustrated by works from across Parker’s career, including those which arose from her investigations into the photogravure. Inspired by the 19th-century photographic pioneer William Henry Fox Talbot, Parker combined two of his early techniques, solar prints and the photogravure, to create a new hybrid form of print by exposing translucent three-dimensional objects to ultraviolet light. Presented here are a collection of 20 large-scale prints from three experimental series: Fox Talbot’s Articles of Glass (2017), One Day This Glass Will Break (2015) and Thirty Pieces of Silver (Exposed) (2015). A wide range of Parker’s sculpture and documentary photography is also included. Bound in hardcover Silver & Glass features an interview with writer and curator David Campany and an essay by Antonia Shaw. David: Where does your interest in photography come from? D: … You’re making it up as you go along in the way Fox Talbot was. C: Yes. I love that non-expert approach, discovering things for the first time. D: Even when you’re not doing something with photography or printmaking, the photographic seems to haunt your work anyway. It might be to do with how you use traces or translations of things, or casts or off-casts of things. C: Yes, my relationship with photography is on that edge of things. In some works I’ve used the tarnish left on the handkerchief after polishing silver (figs. 00 and 00). I was simultaneously taking an impression of an object, gathering a silver trace, and rubbing away a shadow – silver has this duality which I really love, it oxidises. It is a material I seem to be constantly drawn to and I think that’s partly due to its links to photography, the idea that silver gelatin is affected by shadow, that stopping light allows an impression to be formed. D: With that in mind, I would have thought you’d be just as interested in Daguerre, who didn’t use a paper negative like Talbot but a polished silver surface. C: I love Daguerre, but his process was sealed off, encapsulated. I think somehow there’s more space for the artist in Fox Talbot because he outlines all the possibilities and you take it where you want. There’s also something very matter-of-fact about Fox Talbot: he was trying to photograph objects – ceramics, glass, silver. D: It’s uncanny how accurate Fox Talbot was when he outlined all the different ways photography might go. He predicted the artwork, the document, the copy, the complicated status of evidence, cataloguing. It partly comes out of his failed drawing, but he’s not commercially minded at all, just very curious. C: He’s like a maven. Like Duchamp, he moves on when he’s found the apparatus or the way something works. I also work in lots of different ways and jump around a lot – attention-deficit disorder! Alan Cristea invited me to do a prints show at his gallery wanted to know what kind of ideas I was going to pursue. I gave him some ideas but I knew they were only decoys, because when I start working things get jettisoned very quickly. I’d done photo-etching before, and things with stains and inks. I’d made quite a lot of photograms in the dark room, but they had their limitations. For this show, I was trying to find a way of taking an object and making an image with it.